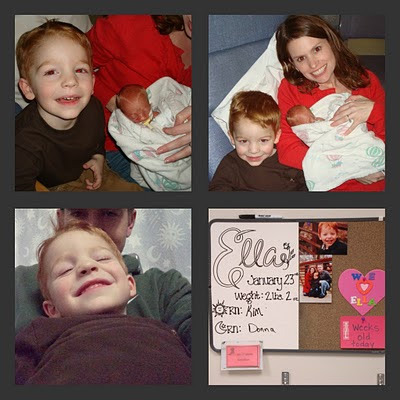 Please go here and read about Ella. My friend, Megan, delievered Ella at 26 weeks after having some complications herself. She is so precious and beautiful. I can't wait until she is strong enough so that I can hold her! My heart is heavy for them right now. We've been through a lot this past month with our boys, but God never fails to remind me to trust in him. He has his hands on Ella and her family. He is in control. They can use prayers...so please pray for her. Ella's beautiful Mommy and such a handsome brother, Carter! Megan, I wish I could be closer, but you are in my prayers daily. I can't wait until Ella is strong and either I make it to KC or you make it home. We left our house this morning at 6am. They took Cole from us at 7:15am and we were meeting with the doctor by 7:30am. It's amazing how quick the surgery goes! We were back with Cole by 7:40am. They said that was normal. Screaming, not knowing what was going on around him...it was so sad. Finally got him calmed down with a bottle. We were heading home by 8am. SO glad we are done with that. We felt everyone's prayers. We thank you for those. Baby hospital gowns...so sad :( He was happy though for not eating since 8:45 last night! Dr. Harris said things went well. He was surprised how happy Cole was considering all of the fluid and puss he sucked out of his ears. He said they were pretty bad, but he got it all so we should see a competely different baby. Yay!!! We are so thankful to have Dr. Harris again. He did Eli's tubes and we had such good luck. We pray that Cole's will be just as successful. I'm so glad to have this over. We hope and pray this is the beginning of of the end of ear infections for little Cole! Thanks again for all of the prayers and thoughts. We felt all of them. I pray that things go smoothly and that he will feel relief soon after. I pray that we will be seeing this beautiful smile more often b/c he just feels so much better! We love you Cole and are trying to do everything possible to make you feel better. He does NOT want to! We've tried bribes...telling him he can't go to pre-school in a diaper...telling him about some of his friends that are potty trained. He TOTALLY could do it. He says it hurts to poop in the potty. (He does have pooping issues!) But those are under control right now! Pretty soon he won't be able to fit into the diapers any more! Cole is 5 months old! I can't believe how fast time is going. It makes me so sad! I didn't even post anything about Cole's 4th month. Poor kid had an ear infection the ENTIRE month. So, now he's 5 months and gets tubes in his ears on Monday. Hopefully he'll be on the mend after that! We love Cole so much. Words can not even begin to describe how much he means to our family. We brightens our day with his big smile and those great blue eyes! He softens my heart when he reaches up with his hands and touches my face and looks me in the eyes. Eli was monitoring the drool! He doesn't like Cole to be messy! Everytime some would drip down, Eli would wipe his mouth and say, "There you go, that's better!" He's such a good big brother! Eli LOVES Cole and Cole LOVES ELi! Laughing...lots of it! Eli is the best at getting him to laugh. Even when Cole is upset, Eli can get him to laugh! He likes to play in his exosaucer...which is also a jumper. He thinks it's great! He likes to sit in his "bumbo" chair! He is eating cereal and has tried squash and sweet potatoes! When he's on his tummy, he pulls his legs under him as if he's going to try to go somewhere! He falls in the "long and skinny" category at the doctor! This is opposite of Eli. I'm wondering if Eli's going to be our wrestler and Cole a basketball player! We love you, Cole. You complete our family and bring us so much joy! I haven't been blogging lately b/c things around here have been crazy. Cole has had double ear infections for about a month now. Just as he seems to get rid of them, they come back. It hasn't been fun around here. I feel so bad for my little guy. He had another antibiotic shot, a catheter and 2 tubes of blood drawn. They are checking his hemoglobin to make sure he's antibodies are working since he hasn't been able to fight these infections at all. So, please pray that his tests come back fine. Pray that Cole is able to get over this infection and STAY healthy to get his tubes on Monday. Pray that my happy little boy will come back soon. Aaron coaches middle school wrestling and they started practices Tuesday. Guess who else loves it? Yep, Eli! How could he not? Aaron's dad was a wrestler, Aaron was a wrestler and if you look at Eli, he just has that build! Tim got Eli that wrestling singlet for his brithday last year. Now anytime he wrestles around the house, he has to put in on. I have to admit, he looks pretty darn cute with it on! Now, me? I'm not so much a wrestling fan. I don't dislike it, just not that interested in it. But I have a feeling that a few years down the road I will be a HUGE fan of it...one person in particular!